In the years preceeding Voyager, we had a few spacecraft that carried the name Pioneer, most notably Pioneer 10 and 11, which in 1973 and 1974, were launched to be the first Jupiter and Saturn explorers. In fact, Pioneer 10 was the first spacecraft to go beyond the asteroid belt, it’s sister ship right behind it. They didn’t have any fancy-pants imaging capabilities, but they took a lot of measurements, sent back a lot of data and, in no uncertain terms, paved the way for the success of the Voyager missions. They also carried a message to any alien civilization that might eventually find them, maybe hundreds of millions of years from now, as they float through the unimaginable emptiness of interstellar space. It’s in the form of a gold plaque, designed by Carl Sagan and Frank Drake, drawn by Sagan’s wife at the time, Linda Salzman Sagan. How flippin’ cool is that? The man and woman on the plaque were deliberately drawn NOT holding hands, since Sagan was worried an extra terrestrial might think we had two heads. 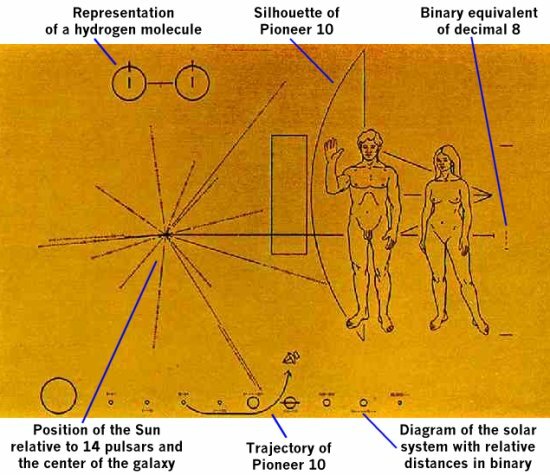 Pioneer 10 sent it’s last transmission in 2003, 30 years after launch, and continues to travel away from our solar system with its sister Pioneer 11 doing the same in almost the opposite direction, now only silent emissaries of the human race. When it came time to think about adding something like this to Voyager, it was definitely taken to the next level. Both Voyagers have, beneath a golden cover with usage instructions engraved upon it, a gold record that contains a fantastically rich greeting from earth, plus pictures, music and information on the things that make us, and our planet, tick. NASA has a nice flash site that allows you to experience all the information that it contains. You’ll probably be shocked by how much there is. It makes the Pioneer message seem like a hasty doodle. Everything an alien needs to listen to the greatest hits of Voyager I and II, which went gold on the first day. This also includes the pulsar-based map to earth. If you saw the movie Starman, you’ve heard a little bit of this record already. If you saw Star Trek: The Motion Picture, you may think the consequences of sending spacecraft like this out into space will be extremely silly. I think it was a very big deal that we did this. We added time, energy, cost and weight to an expensive and complex NASA mission, with no hope of any receipt of the message in our lifetimes. It’s a note in a bottle, tossed into an ocean far, far more vast than any we could possibly imagine. Not to mention that we don’t even know if there’s anyone out there, on any shore, to ever read it, should it ever find its way to one. It’s the longest shot, a leap of faith, the willingness to act with guidance only from our hopes and imagination, the things that make us who we are. The things that make us human. Even if it’s found by some intelligence so different that they never decipher any of the words or meaning, they’ll know it was sent by someone, somewhere, and then the most important part of the message will have been received. It should seem to any of us to make perfect sense that we did this. Then again, who knows, maybe we’ll get a visit from a young Jeff Bridges and he’ll reveal the villainy of our government, which would seem pretty easy these days. Certainly these messages weren’t the reason we sent these craft out there in the first place, it was simply one extra thing that made them even more amazing than they already were as tools of science. The next part will be about some of that science and how it changed our view of where we live in the Milky Way.